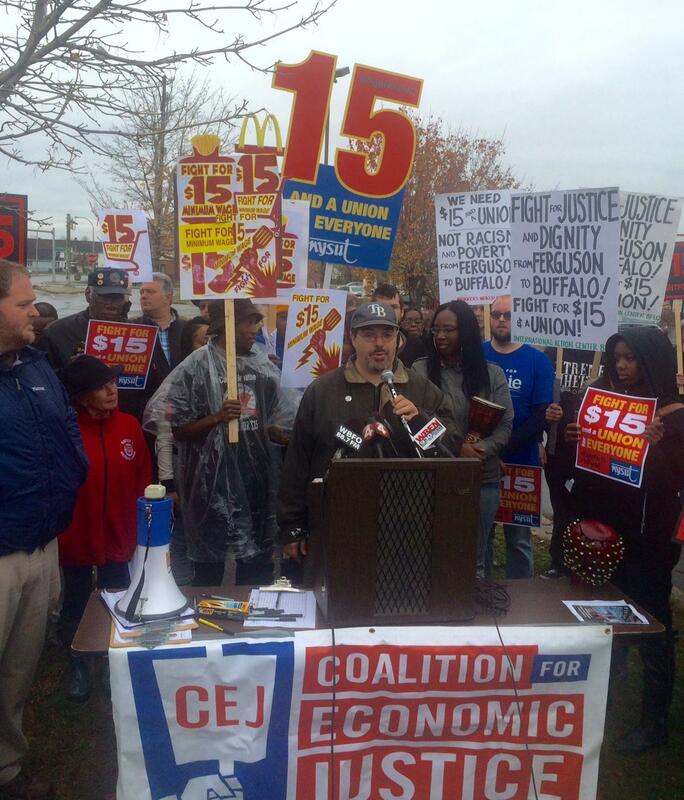 At a rally outside a McDonalds restaurant at 453 William St. in Buffalo Tuesday morning, Coalition for Economic Justice Executive Director Kirk Laubenstein said full-time workers can’t afford to pay their rent making the minimum wage. Kurt Schneiderman, an adjunct professor at Canisius College, says fast food workers make more than adjuncts. Schneiderman says administrators who make six-figures tell low-wage adjuncts that the College can not afford to pay them more. “A business model like McDonalds, like other low-wage employers, that doesn’t actually give people enough money to be able to pay rent and pay for their basic needs, is broken,” Laubenstein said. Advocates are also calling for union rights for low-wage workers. A rally was also held at Buffalo’s City Hall Tuesday afternoon. The protest, one year before election day, was one of 500 planned across the country Tuesday to draw attention to the issue. This entry was posted in clip, press and tagged Fight for 15, Getting Our Money's Worth, Living Wages for a Liveable City. Bookmark the permalink.